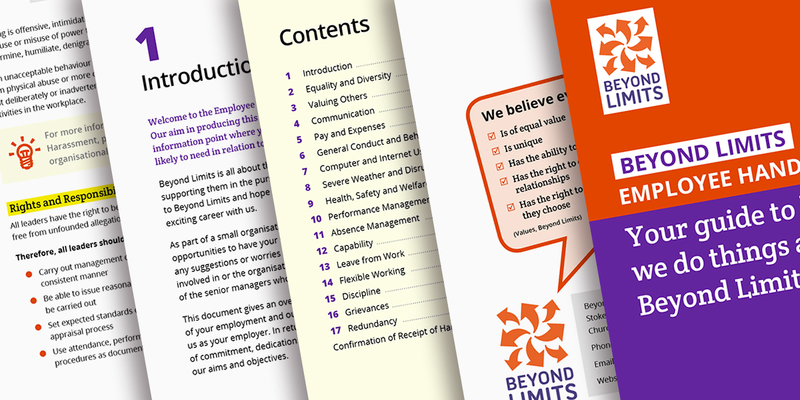 Welcome to the new and revised Employee Handbook, your guide to how we do things at Beyond Limits. This handbook should be your first stop when you are looking for information, it will give you an overview of your terms and conditions and let you know about our expectations of you. Please read it carefully during the course of your induction and refer back to it for anything that you are not sure about. Please also remember to sign the receipt form at the back, to confirm you have read and understood the contents and pass the completed form to your line manager. For more information on any of the policies and procedures that are referenced in the handbook, please access these via the Staff Area of the website in the Policies and Procedures section. You can download and save the Handbook as a PDF to view offline or read it below. If you have any comment or feedback about the handbook please contact us.